See recipe for Armenan-Style Yogurt Cheese that is prepared from fresh yogurt either home-made or from the store. Cucumber needs to be peeled, seeded and grated. 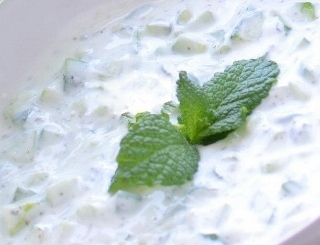 Strain yogurt in cheesecloth as per Armenan-Style Yogurt Cheese recipe. Needs to be done the day before. On preparation day, peel and seed cucumber and coarsely grate. In a large bowl, combine grated cucumber, garlic, olive oil and spices and mix well. Add yogurt cheese and stir to blend. Can be served directly but the flavor improves if made the day before and stored, tightly covered, in the refrigerator overnight. Variations: You can add thinly sliced red onions or sliced scallions to the mixture. You can add a scant amount of lemon juice for a bit of tang. Or, you can add a bit of chopped basil.